Last week marked my one year anniversary of living in Israel. Prior to moving here, I had never even visited the country, so was not entirely sure what to expect. Being a food writer, I was most excited about one thing: the food. As a fairly young country, Israeli cuisine is something that is still being defined, a mixture of cultures from around the world. The cuisines of its neighboring Middle Eastern countries are reflected in many of the dishes, but you’ll also find North African, Mediterranean, Eastern European, and Asian influences. In line with a Mediterranean diet, Israeli food is relatively healthy. They use way more olive oil than butter, have salad with every meal (including breakfast), and drink tons of fresh juice. 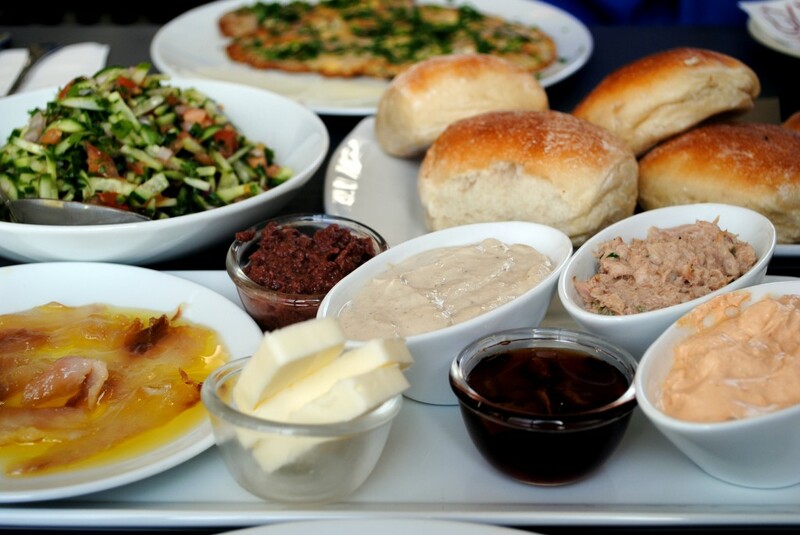 I’ve compiled a list of some of the most typical Israeli foods, a primer if you will. Most of these dishes have roots elsewhere, and this is not necessarily what every Israeli eats every day, but they’re all quite common and should provide a good peak into Israeli cuisine. Borekas – These savory turnovers of Balkan or Ottoman origin are ubiquitous, available at the corner deli, every café, and most bakeries and are eaten any time of day. They come with numerous possible fillings including mushroom, pizza (often with olives), cheese, potato, and spinach. They are often sliced open and stuffed with sliced hard-boiled eggs to make for a hearty snack or lunch. Falafel – One of the most famous Middle Eastern foods, falafel (fried chickpea fritters) probably originated in Egypt. Wherever it started, it’s now omnipresent in Israel with a falafel shop on every corner. And the falafel here are unlike those I’ve enjoyed anywhere else – perfectly crisp outsides coating a tender and flavorful middle. They are served in a pita with tahina, sauces, and salads, or they can be ordered individually for about 1 shekel (about 30 cents) per falafel ball. Hummus – Nearly every country in the Middle East has tried to claim hummus (chickpea and tahina dip) as its own, and Israel is certainly proud of its version. Unlike in the US where hummus is considered a snack, in Israel it is a meal, be it breakfast or lunch. There are entire restaurants devoted exclusively to hummus, each with its own loyal following and distinct style. It is typically served plain or with a topping and with plenty of fresh pita, pickles, hard-boiled eggs, and falafel balls. Israeli Salad – A simple mix of tomatoes and cucumbers dressed with olive oil and lemon juice, Israeli salad shows up everywhere in Israel: as an accompaniment to breakfast, topping your falafel or shawarma, in a huge bowl for lunch. The straightforward dish (which has similar iterations all over the region) most likely originated in Israel’s early Kibbutzim, when workers prepared simple communal meals fresh from the fields. Kubbeh – My absolute favorite culinary discovery since living in Israel, Kubbeh is a soup of Iraqi-Jewish origin (check out my recipe for it here). The soup, which is often beet-based (for Kubbeh Adom) includes hearty dumplings with a meat filling and semolina shell. Although the soup is not as widely popular as falafel, it does show up on café menus and at the numerous Iraqi-Jewish restaurants, especially in Jerusalem. Mangal – Mangal refers to Israeli barbecue and is any kind of meat, often on a skewer. There are restaurants devoted to this style of cooking, but it is also extremely popular at homes (much like the American barbecue tradition). The meat is typically heavily seasoned but otherwise plain and served along with a variety of mezze (see next entry). Mezze – Mezze refers to any number of salads, dips, and spreads offered before many an Israeli meal (check out my post on Mezze here). Hummus and tahina dip are usually present and complimented by tabbouleh, Moroccan carrot salad, pickled beets, baba ghanouj, cooked tomato salad (and lots more) and plenty of fresh pita or laffa (a flatbread). Sabich – Another amazing pita sandwich that deserves more international attention. Sabich is a pita stuffed with cold fried eggplant, sliced hard-boiled egg, Israeli salad, and amba (a pickled mango condiment). Delicious. Schnitzel – I know it sounds weird to include schnitzel in a list of Israeli foods, but some have argued that schnitzel is the most Israeli food. Consider it the Israeli version of American chicken fingers (indeed, McDonald’s here serves schnitzel fingers instead). Chicken schnitzel is common on menus of all kinds from fast food to high end, and it is a favorite food of school children as well as adults. Shakshuka – A Tripoli (Libyan) dish that is immensely popular in Israel, shakshuka is a dish of eggs cooked in tomato sauce. It’s commonly served for both breakfast and lunch, both straight from the pan or put on a sandwich. Shawarma – Another one you have likely heard of, shawarma is seasoned, spit-roasted, shaved lamb, chicken, or turkey typically served in a pita with all the usual fillings. The meat is typically tender and flavorful, although slightly greasy. Toast – Israelis love toast, and it doesn’t mean a piece of toasted bread. In Israel toast is something akin to a grilled cheese sandwich. Served on a bagel or bread, closed or open-faced, and with any combination of fillings (mozzarella and pesto; tuna and hard-boiled egg; feta and olives) it’s a standard lunch option. Mmmmm, reading your posts always make me incredibly hungry. You definitely captured the food in Israel! Lots of favorites here for me…especially sabich. I originally found your kubbah recipe on food52 and it is wonderful. Thank you Hannah!! I love sabich too – so good! I noticed when I was home over the summer that some falafel places in New York are starting to put it on their menus! I lived in Israel for 4 years off and on and I loved the kibbutz food. Breakfast was always wonderful with freshly baked bread. However, working in the kitchen and having to make hundreds of eggs, that wasn’t so good. lol I miss it. That’s so great! Yes breakfast is definitely one of the most wonderful meals here. I just love it – the table spread with cheeses, olives, dips, bread, and eggs. Haha I know what you mean about overdosing on hummus and falafel!! I try not to eat it all the time so it doesn’t happen, and it’s such a treat when I do! Such a great post Katherine! I’d love to come visit and eat Israeli food with you! Thanks Winnie! Oh I’d love it if you could come visit! We’d have such fun!! Thank you Theresa!! I’m so happy to have discovered all of them in the past year. Awesome pictures here, I love trying new international dishes. I have been kind of on an Indian curry kick lately but you have inspired me to try Israeli food on my next endeavor. Great post! Thanks Tina! I love Indian curries – and any curry! I do hope you’ll have an Israeli food kick! So much good food. WOW! Thank you for such a great description of Israeli food! I knew very little about it. I’ll start with Shawarma and toast. 🙂 Sounds like you’re having a culinary adventure for sure. I look forward to learning more about Israeli food. I almost ate my computer! Wow it is a very colorful and delicious food items. This is a very good stuff about israle foods. Thank you so much. the food is so delicious. Chic peas are one of my favorite. I ate peanut butter today and it calmes the appetite for hours.